Mattresses up to 39″ wide are Twin Size. 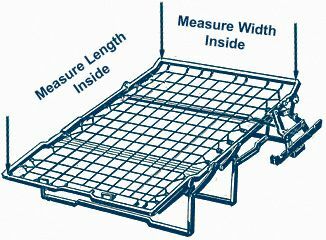 Mattresses between 40″ and 54″wide are Full Size. Mattresses between 55″ and 60″wide are Queen Size. Mattresses between 60″ and 66″wide are Super Queen Size. You should measure the frame, not the sofa mattress. Don’t worry about corners of the frame, our sofa bed mattresses have slightly rounded corners. Measure the frame inside, and round down to the next inch. For example 68-3/4″ would become 68″.